A Chinese engineer has “married” a robot he created after failing to find a human spouse. Zheng Jiajia, 31, an artificial intelligence expert who designs and creates robots in Hangzhou, Zhejiang province, created the “female” robot at the end of last year, the Qianjiang Evening News reported. 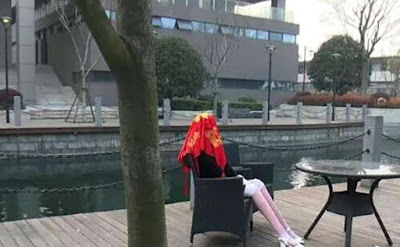 The robot, which he named Yingying, can identify Chinese characters and images and even say a few simple words, Zheng “married” his creation in a simple ceremony. Yingying wore a black suit on the day and “her”head was covered with a red scarf during the ceremony, a traditional Chinese wedding ritual. Witnesses to the event were Zheng’s mother and his friends.One of his friends said that Zheng had grown frustrated after failing to find a girlfriend. The report said Zheng planned to upgrade his robot “wife” to enable her to walk and even help out with household chores.